Syed Haider Raza Alias S.H. Raza (born 22 February 1922) is an Indian artist who has lived and worked in France since 1950, but maintains strong ties with India. 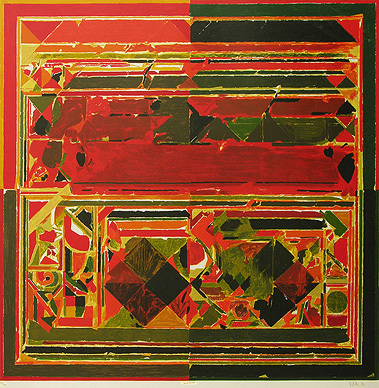 His works are mainly abstracts in oil or acrylic, with a very rich use of color, replete with icons from Indian cosmology as well as its philosophy. He was awarded the Padma Shri and Fellowship of the Lalit Kala Akademi in 1981, Padma Bhushan in 2007, and Padma Vibhushan in 2013. He became India's priciest modern artist on 10 June 2010 when a seminal work, 'Saurashtra' by the 88-year-old sold for INR 16.42 crore ($3,486,965) at a Christie's auction. Syed Haider Raza was born in Babaria, Mandla district, Madhya Pradesh. 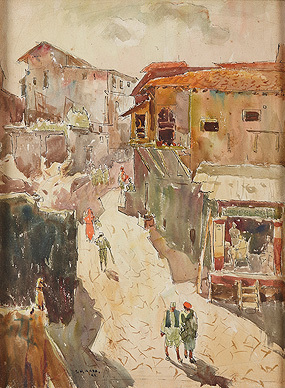 After high school, he studied further at the Nagpur School of Art, Nagpur (1939–43), followed by Sir J. J. School of Art, Bombay (1943–47), before moving to France in October 1950 to study at the École nationale supérieure des Beaux-Arts (ENSB-A) in Paris, 1950-1953 on a Govt. of France scholarship. After his studies, he travelled across Europe, and continued to live and exhibit his work in Paris. He was later awarded the Prix de la critique in Paris in 1956, becoming the first non-French artist to receive the honour. Syed Haider Raza, has his first solo show in 1946 at Bombay Art Society Salon, and was awarded the Silver Medal of the society. His work evolved from painting expressionistic landscapes to abstract ones. From his fluent water colours of landscapes and townscapes executed in the early 40's he moved towards a more expressive language painting landscapes of the mind. Once in France, he continued to experiment with currents of Western Modernism moving from Expressionist modes towards greater abstraction and eventually incorporating elements of Tantrism from Indian scriptures. Whereas his fellow contemporaries dealt with more figural subjects, Raza chose to focus on landscapes in the 1940s and 50s, inspired in part by a move to the France. In 1959, he married French artist, Janine Mongillat, and three years later, in 1962, he became a visiting lecturer at the University of California in Berkeley, USA. Raza was initially enamored of the bucolic countryside of rural France. 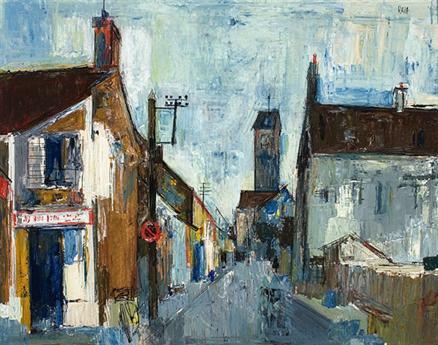 Eglise is part of a series which captures the rolling terrain and quaint village architecture of this region. Showing a tumultuous church engulfed by an inky blue night sky, Raza uses gestural brushstrokes and a heavily impasto-ed application of paint, stylistic devices which hint at his later 1970s abstractions. 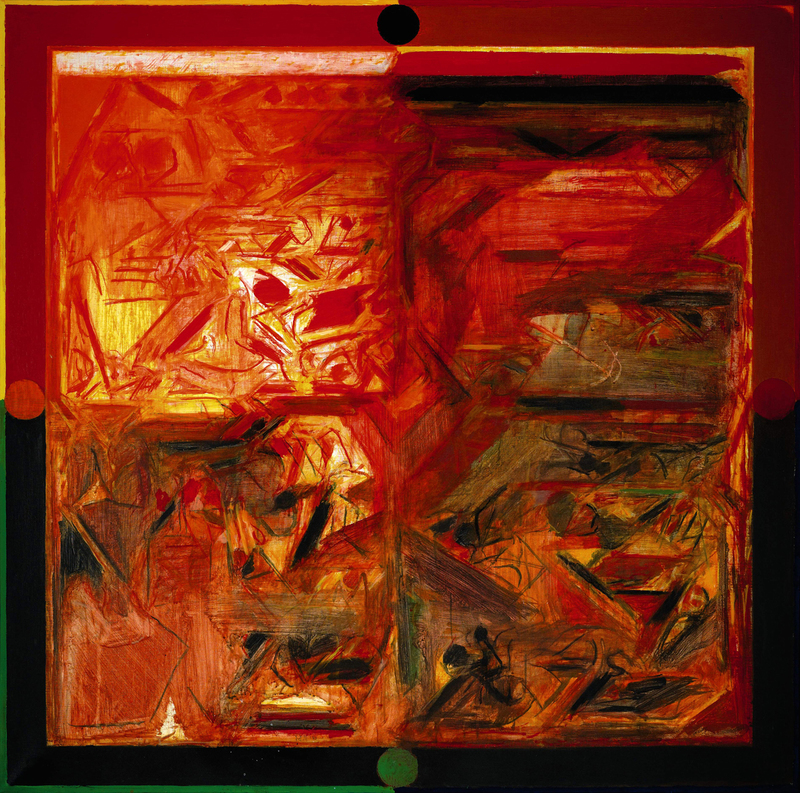 By the 1970s Raza had grown increasingly unhappy and restless with his own work and wanted to find a new direction and deeper authenticity in his work, and move away from what he called the 'plastic art'. His trips to India, especially to caves of Ajanta - Ellora, followed by those to Benaras, Gujarat and Rajasthan, made him realise his ro and study Indian culture more closely, the result was 'Bindu', which signified his rebirth as a painter. The Bindu came forth in 1980, and took his work deeper and brought in, his new-found Indian vision and Indian ethnography. One of the reasons he attributes to the origin of the 'Bindu', have been his elementary school teacher, who on finding him lacking adequate concentration, drew a dot on the blackboard and asked him to concentrate on it. Rajasthan, is a large dazzling canvas (175x175 cm) in which dramatic blacks, oranges and greens predominate. “ "My work is my own inner experience and involvement with the mysteries of nature and form which is expressed in colour, line, space and light". The unique energy vibrating with colour in his early landscapes are now more subtle but equally, if not more, dynamic. 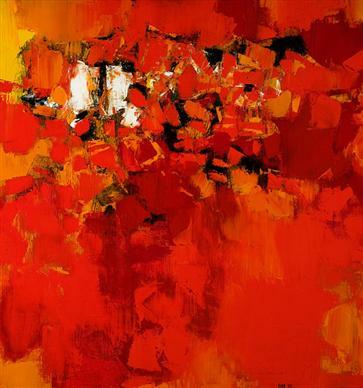 Raza abandoned the expressionistic landscape for a geometric abstraction and the 'Bindu'. Raza perceives the Bindu as the center of creation and existence progressing towards forms and colour as well as energy, sound, space and time. His work took another leap in 2000, when he began to express his increasingly deepened insights and thoughts on Indian spiritual, and created works around the Kundalini, Nagas and the Mahabharat.